There has always been much discussion in the world of music entertainment over just who hold the rights to the music a band creates. Many lawsuits have been fought and many friendships have been broken over this issue. 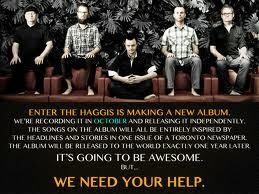 Recently a Celtic Rock Band out of Toronto, Enter the Haggis, parted ways with their record label and struck out on their own. With the hopes of creating a new album under their own creative control they were faced with a very real problem. How are we going to fund this? The answer for them Kickstarter.com. Kickstarter claims to be the world’s largest platform for funding creative projects. They help fund projects in music, theater, film, publishing and more. Here is how it worked for ETH. They put up their project making sure the pitch to the public was genuine and fun to read. Then they created a plethora of incentives for various funding levels from a digital download of the finished album to a having lunch with the band and more. They also aimed low asking for only half of what they needed to fund the production. What happened next was amazing. On July 7th, I had the pleasure of attending a concert at which the band told us to watch for a big announcement at noon the next day. Sure enough at noon the announcement of a new concept album was announced. It was sent out via social media and email to their very loyal fan base affectionately known as “Haggis Heads”. The idea, pick a day and a newspaper and create an entire album inspired by the stories that appear in the paper. The first 1500 copies ordered would also receive a copy of the paper. The plea, by September 1st they needed $20,000 to make it happen. Well happen it did. In the first hour $5000 came in, in 8 hours $16,000. The band was awed. They opened new incentives for ones that were sold out, they pledged free stuff if they hit overall funding levels and it worked! In two days they hit $30,000 shortly after $40,000, full funding. They have promised a professional music video and a publicist if they hit $50,000 and I have no doubt they will. So what makes these kind of fund drives so successful. Perhaps it’s the idea that those of us less talented in some areas can come along for the ride. Maybe it’s the idea that individuals have the right to own their own creative products. Maybe it’s the ease and excitement of being part of the “in crowd”. Maybe a little of each. Other bands, like Scythian who funded their album “It’s Not Too Late” in this manner using Indiegogo have also had over the top success. Scythian pledged to donate any excess funds to charity. There is even a site, Kiva, that allows regular folks to make loans in amount as low as $25 to struggling entrepeneurs in emerging nations. The loan is repaid with interest over time. For me I more than like the idea that I can help further another person’s creative contribution. Whether it’s in helping to a band to produce an album that will bring a smile to someone’s face or in the case of a Kiva loan helping someone to feed their family or rebuild a home. Creativity should be encouraged. 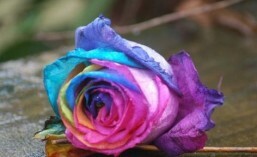 How about you, how will you join the Creative Revolution? Click below for some places to start. UPDATE: As of August 26, ETH hit over $60,000, three times their original request and there are 6 days to go. This entry was posted in #CMC11 and tagged #CMC11. Bookmark the permalink.